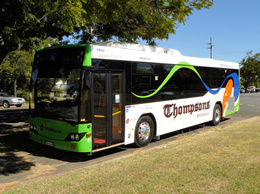 Thompson's is proud to provide Urban Services for part of the Moreton Bay Region in associaton with Translink. Please find our current route descriptions below, and download a timetable for the relevant Urban Service underneath. For further information, please access the Translink Journey Planner. Current fares are available from Translink Fares. servicing Lawnton station and Bray Park station. Operates Monday to Friday only (except public holidays). servicing Strathpine Shopping Centre and Bray Park High School. Operates 7 days. servicing Bray Park station. Operates 7 days. servicing Bray Park station, Bray Park and Warner. Operates 7 days. servicing Bray Park, Kensington Village Shopping Centre, Bray Park station and Strathpine. Operates 7 days. servicing Lawnton, Lawnton station and Strathpine. Operates 7 days. servicing Murrumba Downs Shopping Centre, Kallangur station and North Lakes Health Precinct. Operates 7 days. servicing Murrumba Downs Shopping Centre, Murrumba Downs station and North Lakes Health Precinct. Operates 7 days.